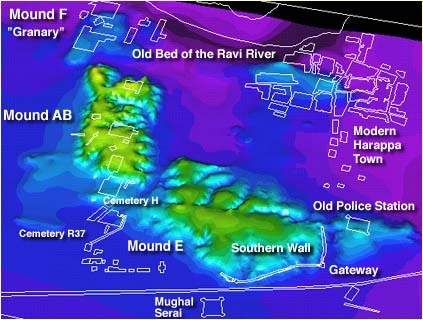 There also appears to be a smaller mound that is present at the modern Harappa town site. This could be a modern representation of the processes that built ancient Harappa. This is especially noticeable since the surrounding topography in the floodplain of the River Ravi is essentially flat. Other noticeable features in the modern topography digital terrain model are the gullies in the mounds that are oriented in the cardinal compass directions. It is believed that these gullies are the remains of streets in ancient Harappa. It should be noted that Vats' topographic map does not reflect his and others' subsequent modifications of the terrain from extensive archaeologic excavations.